For her second exhibition at Gimpel Fils, Araya Rasdjarmrearnsook will present a new body of work that explores how the narratives of art history are constructed and by whom. 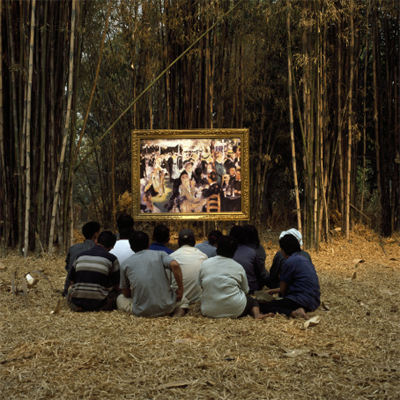 The Two Planets series (2007-2008) comprises film and photographic work recording the responses of Thai farmers to well-known western art masterpieces. Rasdjarmrearnsooks project was inspired by her work as a tutor at Chiang Mai University. During seminars she became aware of the fact that many students were faltering when asked to criticize great art works. For Rasdjarmrearnsook, the students hesitancy and doubt stemmed from the realisation that the works were already recognised as great, and they were unsure of how to react. At the same time, Rasdjarmrearnsook moved from the city of Chiang Mai to its rural suburb. Her daily scenery changed from the urban cityscape to agricultural scenes of bean fields and sometimes rice paddy, according to harvesting seasons. The Two Planets series unifies two worlds, that of art history and that of rural Thailand. Sitting before life-size reproductions of works such as Édouard Manets Le Dejeuner sur lherbe farmers and gardeners who do not know the financial or cultural value and history of the artworks speak about them with a freedom not available to Rasdjarmrearnsooks students. The recorded conversations involve guesses and presumptions about what is in front of them, questioning what the protagonists are doing and why. In order to talk about Manets risqué picnic, the farmers bring humour and use slang to replace words that, in Thai culture, should not be spoken between men and women. Rasdjarmrearnsooks film and photographic works raise issues regarding the current debate over interpretation or experience: can we have a full appreciation of an artwork even if we dont have all the information and history about it? To what extent does an over abundance of information and interpretation blind us to the pleasure of looking at an artwork and using our imaginations? Araya Rasdjarmrearnsook is a Professor of Fine Art at Chiang Mai University, Thailand and has exhibited widely. Solo exhibitions include: The Class, Downstairs at Gimpel Fils, 2006; Lament, Tensta Konsthall, Stockholm (2003); Why Is It Poetry Rather than Awareness? National Gallery, Bangkok (2002); At Nightfall Candles Are Lighted, Contemporary Art Museum, Chiang Mai and Chulalongkorn University Art Gallery, Bangkok (1999-2000); Lament of Desire, ArtPace, San Antonio, Texas, and the Faculty of Fine Art Gallery, Chiang Mai, Thailand (1998-99); Printmaking and Drawing, Atelier Forsthaus, Gifhorn, Germany (1990,1991). Group exhibitions include Dreaming/Sleeping, Passage de Retz, Paris, 2008; Those Dying wishing to stay, those living preparing to leave at the Thai Pavilion, 51 Venice Biennale, 2005; 54th Carnegie International, Pittsburgh, 2004-5; Insomnia, Institute of Contemporary Arts, London, (2005); Poetic Justice, 8th International Istanbul Biennial, Turkey (2003); EV+A 2002, Limerick, Ireland (2002); 1st Johannesburg Biennial, South Africa (1995); 1st Asia-Pacific Triennial, Brisbane, Australia (1993).